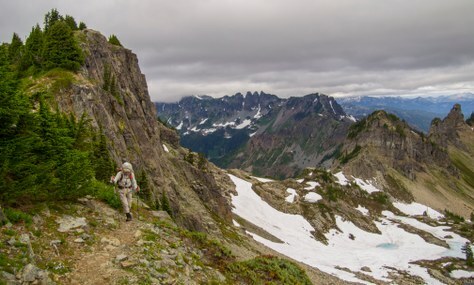 Hike leader Chris Ensor shares tips and tricks from a recent REI presentation for a lifetime of healthy hiking! On Monday, August 13, 2018, I attended a free presentation at REI by Dr. Michael Domingo, DPT, OCS entitled "Exercises for Healthy Hiking". I learned a lot about how to stay active in the outdoors as you enter your 'wiser years', and with Dr. Domingo's permission I want to share those tips with you. As a longtime hiker in his senior years, I found this presentation really helpful and informative. My knees suffer during and after a longer hike, especially on steeper downhill trails. In talking with Dr. Domingo, he suggested that I keep my knees pointed toward my pinky toes and try to avoid my knees bending inwards, as I currently often do. I should try to feel the weight push through the outside of my foot as I step. 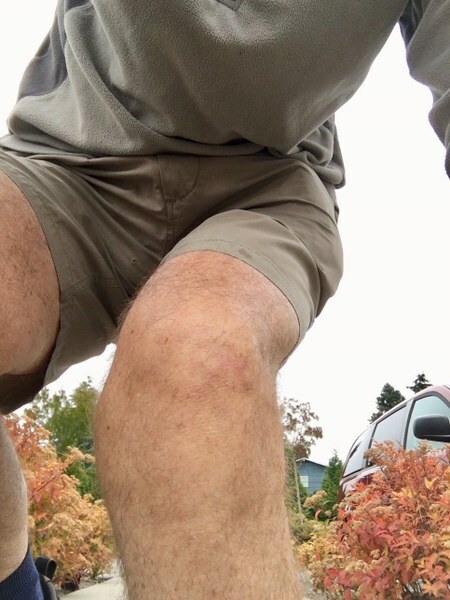 This picture shows my left knee collapsing a little towards the right (inwards) while descending a step. This strains the knee muscles and should be avoided. This picture shows my left knee bending down the slope. You can't see my left foot, but the knee is pointing to my pinky toe. This is a less stressful movement and better for my knees. The difference between the two pictures is quite subtle, but it seems to make a big difference! 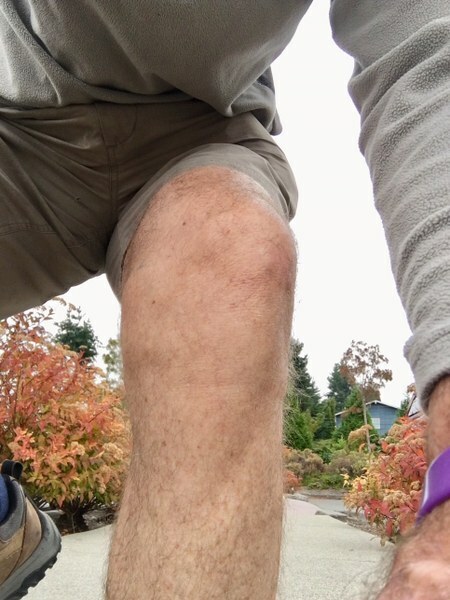 I tried focusing on the direction of my knees on my next hike and it really helped. Also, for swelling of the foot, ankle, or knee following a twist or sprain while hiking, Dr. Domingo recommended ice treatment only for the first 24 hours (I find a packet of frozen peas wrapped in a towel works great). Then, switch to heat treatment and avoid the ice. Much of the presentation focused on exercises to strengthen ankles, knees, and lower back for successful, injury-free hiking. Dr. Domingo has given permission to share his presentation with other Mountaineers hikers. I think these exercises could be most useful to our hikers in helping avoid injury on the trail by giving us a routine to increase our strength, endurance, coordination, balance, and flexibility. I plan to try them! I would like to join this group. I am a member. I don't see any place to register not a schedule.